The scientific name desperata is derived from the Latin “desperatus,” meaning “desperate”, reflecting the desperate state of this species’ future. Despite its entire range falling within a nature reserve in northern Madagascar, severe habitat destruction threatens the survival of this recently described chameleon. Brookesia chameleons diverged from all other living species more than 50 million years ago, long before our ancestors diverged from those of modern baboons, tamarins and capuchin monkeys! This tiny chameleon, which measures no more than 3 cm from snout to vent, is a forest specialist. Whilst it may persist in moderately degraded habitat, it is unlikely to survive significant habitat degradation or hugely altered landscapes. Though this species is locally abundant at the single site where it survives, it is thought to be in decline due to the ongoing habitat loss across its range. All species in the genus Brookesia are listed on CITES Appendix II, though there is no known trade of this species. The primary actions to conserve this species involve enforcing the protection of its forest habitat and engagement with local communities. Brookesia desperata is endemic to the Foret d’Ambre Special Reserve in northern Madagascar and may be restricted to an area less than 50 km2. 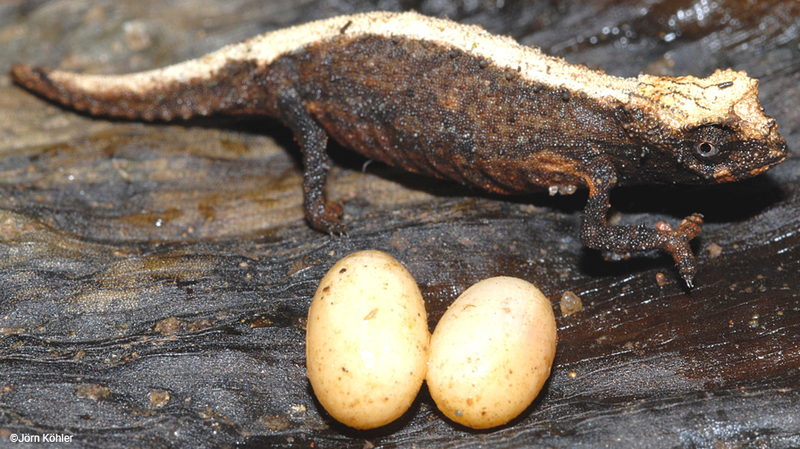 This minute chameleon is oviparous and lays two large eggs in a single reproductive event. They roost on the low branches and leaves of rainforest vegetation at night and can be found on non-native plants in cleared areas.